Cage size is a very important factor to consider. Note that the minimum area a rabbit should be confined in is 12 square feet, but also they need additional space for exercise. I urge you to setup cage that will give them space to play and exercise freely. When planning and designing the cage, it's also advisable to think about anything to add in the cage - for instance, "a litter tray" so as to make sure they fit in your plans. The size of the cage depends on the location of your cage. There is no point building the perfect cage and then finding it won't fit through a door way or is blocking a plug socket you need access to. You may like to take advantage of a cupboard, space under the stairs, or alcove to build your that rabbit house. 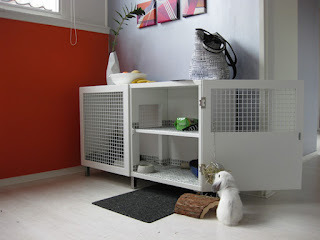 This is a good way to create a rabbit space without occupying too much space. Note: Choose a location where your rabbit won't disturb your sleep if they choose to play at at night. Your choice of materials to use in making your cage should be chew proof and non toxic. There are lots of options depending on how you want your cage to look and the needs of your rabbit. Most untreated wood is fine to use for example pine, - plywood is commonly used to build outdoor rabbit housing. MDF is toxic if the dust is inhaled, Different cuts of wood can be used for different purposes for example trim is good for covering edges that might get chewed and skirting board can make a nice tray. Corrugated plastic sheets (Correx) can be an easy to use building material - though they aren't very chew proof. I'd suggest using weld mesh if your cage will include a mesh section. Plastic or powder coated mesh can look better than bare wire. If you can buy coated mesh in the size/colour you'd like then you can coat your own using Plastikote Fast Dry Enamel, which is non toxic when dry and available in a range of colours. Fitting the mesh on the inside of the frame generally gives a neater finish and also helps prevent your rabbit chewing the frame by limiting access. Lino flooring is a nice option as it's cheap and can be cut to any size for easy to installation. Fit it using double sided tape or flooring adhesive. The edges can then be finished off with bathroom sealant to give a neat finish, protect them from chewing and prevent any liquid running underneath. Alternatively you'll find a range of trims, either flat to cover joins or corner shaped to hide edges - this is a good option if you had trouble cutting the flooring edges neatly as they get hidden under the trim! Tiles are also an option, though they take a little more skill to fit and can be slippy if too smooth. Keep in mind rabbits have fluff on the bottom of their feet, not pads, so can have trouble with slippery surfaces. If you find your floor choice doesn't have enough grip, you can add a rug, woven mat or rubber stable matting over the floor afterwards. If you have the height available, adding a shelf to the cage can be a good way to add extra floor space and rabbits like to have a raised platform to rest/lookout from. A shelf can be supported with shelf brackets (like you'd use for a bookshelf) or if the walls are mesh, by slotting a couple of lengths of wood all the way through to span the gap and fixing a board on top. Notch the wood supports so they sit over the mesh to stop them moving. If the shelf is quite low e.g. less than one foot (30cm) your rabbit maybe able to easily jump up and down without any help. For higher shelves, or less agile rabbits, you can add a ramp - easy to make from a flat piece of board with pieces of trim to create grip. Another alternative is a series of small shelves leading up to make steps. These take up less room than a ramp. when designing a rabbit cage, cleaning routine should be considered especially when planning for flooring. Always make sure that the doorways are wide enough for easy removal and cleaning of litter tray, ramps and boxes. Making a ramp removable can make sweeping around it a lot easier. Avoid any small spaces between mesh and frame that can fill with hay and be difficult to clean. You might also want to consider keeping the area around the cage clean - hay and litter has a tendency to spread well, so a substrate board/tray around the base of the cage will help keep mess contained if your rabbit start digging and throwing things around.